Every day Kion grew, not in strength but in wisdom and power. His body had reached the size of a huge lion, and his roar was more powerful than the roar of any Prideland lion. That afternoon, Kion had finished with three piercing lions, with the only help of an egret named Ono, since the guard had already dispersed. 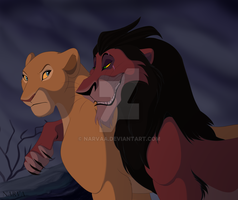 All praised Kion, and it seemed that all the lionesses esteemed him too much... and this tormented Kovu, creating a feeling that still Kovu didn't understand... hate...envy. Forgive my writing... and forgiving my english. I just wanted to write a little story, about the drawn I wanted to try a thicker line style, but I like thin lines . I hope you like it! Edit 27june : Flip the image horizontally, because Kovu's scar was not in the right place, and add the guard's mark of the Kion. Forgive your writing? Your English? Good gosh, there’s nothing to forgive! The picture and story are absolutely amazing, great work, as always! (image needs to be flipped horizontally) Nice lighting! I thought the same thing I think I'm going to do it. Thanks!